Want the best Mac data recovery software to recover data on Mac OS X? Here’s the list of top 10 best data recovery software for Mac to recover deleted files, folders, photos, music, videos, and emails etc. Select your best free Mac data recovery software carefully. We all know that data recovery software and data recovery service are the programs which help users to recover lost, accidentally deleted, or formatted files. You might also like to know: How to Recover Deleted Files from Computer? In this digital era, losing important files such as photos, videos, documents, emails, audio, and many more things from the computer might be might be a very painful situation for you. This is the main reason, you should always have a powerful yet easy-to-use free data recovery software to recover deleted files without any headache. It doesn’t matter what you use. Whether you use a Windows computer or Mac system, having a multi-functional data recovery software or hard disk recovery software to easily recover files lost due to accidental deletion, disk formatting, partition loss, software crash, virus infection, etc. is always profitable. There is plenty of free data recovery software for Mac available on the web and if you are looking for the best one then you are at the right place. In today’s Mac guide, we are going to share a complete list of some best Mac data recovery software. So, let’s have a look at the list of top 10 best data recovery software for Mac. If you are using Mac OS X and have accidentally deleted some really important files or documents from your hard drive (external hard drive or internal hard drive) then obviously you will wish to do anything for retrieving the deleted files back on your system. In case, you are planning to use a best free Mac data recovery software to recover deleted files but you don’t have any idea – What is the best data recovery software for Mac OS X? or, What is the best source of mac data recovery software free download? then this guide is perfect for you. Here, we have listed top 10 professional data recovery software for Mac. All these hard drive data recovery software and file recovery software for Mac OS X are extremely helpful in recovering deleted, formatted, inaccessible files under Mac OS X. If you are looking for the best and reliable Mac data recovery software to recover data on Mac OS X then Stellar Phoenix Mac Data Recovery is the most appropriate option for you. The Stellar Phoenix Mac Data Recovery program is specially designed to recover lost data efficiently on Mac and it performs secure and accurate recovery of all lost documents, photos, audio files, or videos files that have been accidentally or even intentionally deleted from HFS, HFS+, FAT, ExFAT and NTFS format based file systems. We hope you found some ultimate and helpful data recovery features here. So, if you want to get your deleted data back on Mac OS X as quick as possible then start using Stellar Phoenix Mac Data Recovery software right now. Test Disk is a powerful Mac data recovery software. If the partitions of your hard disk are lost, you can get them back with the help of Test Disk data recovery software for Mac. This open source software even allows you to make the non-bootable disks bootable again. If your Mac has experienced crashing issues due to viruses or human errors, Test Disk is the best recovery software which you can use. You might also like: How to Recover Lost or Deleted Photos on iPhone Devices? Data Recovery 3 by Cisdem is also a very useful data recovery software which you can use on all versions of Mac operating system. There are a lot of advanced features which one get in this software such as restoration of data which has been deleted, formatted or lost. If you have lost data on your portable devices like Pen drive, memory card or even a digital camera, you can use Data recovery 3 on it. Support HFS+, FAT16, FAT32, exFAT, NTFS, etc. file systems. Perfectly compatible with Mac OS X 10.11, 10.10, 10.9, 10.8, etc. Four data recovery modes: Document Recovery, Media Recovery, Archive File Recovery, and Universal Recovery. Data Recovery Wizard for Mac Free by EaseUS is a professional data recovery software for Mac. The software comes with user-friendly interface and helps in recovery of deleted or lost files. You just have to click on a button which will start scanning your system and will look for possible files which are deleted by mistake. Once the scanning is done, you can select the files which you want to recover on your computer. With the help of Data Recovery Wizard for Mac free edition, you can recover 2 GB amount of data. One of the main reasons that data is lost in a system is due to viruses. If your hard disk is crashed or data has been damaged because of viruses then you can use Mac data recovery. This best data recovery software for mac will remove all the viruses which have led to deletion of the data and retrieve the lost data back. The quick search results will help you in finding the lost files back. Just like other file recovery software for Mac, iSkysoft Data Recovery tool also helps in recovery of lost files. You will get some extra features in this tool such as raw file recovery, lost file recovery and much more. 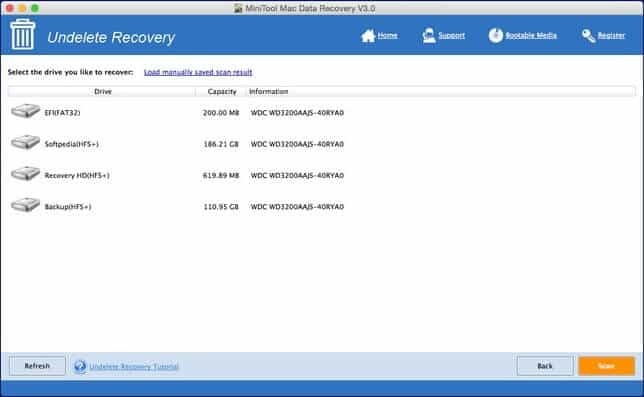 If you have lost the partitions on your system when you were trying to format your system, you can use Data recovery to get them back. The software is fully compatible with 10.11 (El Capitan), 10.10 (Yosemite), 10.9, 10.8, 10.7, 10.6 and 10.5. You can recover pretty much anything using MiniTool Mac Data Recovery Personal. This is one of the best data recovery software which will help in recovering all types of files. You can search for images, audio, video or even documents using this tool. The data preview effect will show you the preview of the file before you begin the recovery process. Recover files like photos, music, video, emails, and documents from Mac or other devices. “Advanced Filter” helps to filter out unnecessary files via file name, extension name, file size, and creation time, thus saving much time. With the personal license, Mac users are allowed to use the Mac data recovery software in one computer. If you want to use a free hard disk recovery software you can try Data Recovery Free by Softote Studio. The software is available in Mac store for free. The interface of the app is clean which makes it extremely easy for one to recover the files. Bmp, jpg, png, tif, mp3 files can be easily retrieved. Found files can be previewed, which allows you choose your target files to recover only. Compatible File Systems: HFS, HFS+, NTFS, FAT16, FAT32, NTFS5, EXT3 and EXT4. The new version is compatible with latest Mac OS X 10.9 Mavericks. Enhanced search and recover ability, which can find the lost/deleted/formatted files out on the hard disk(s) or other storage device(s). File Salvage is a professional data recovery software for Mac. This tool is used by a lot of professionals for recovery of lost data. You can use File Salvage on any version of Mac operating system. Most of the hard disk recovery software slow down the system which is not the case with File Salvage as it consumes very little resources. You can easily recover your lost files, iTunes libraries, iPhoto collections, and to rescue data that has been lost with this helpful data recovery program. Last but not the least is Data Rescue 4. This hard drive data recovery software takes help of the ISO Class 5 environment for recovery of files. You can even recover the data which was lost in a hard disk crash using data rescue 4 program. Feature that allows Data Rescue to create a bootable disk to aid in recovering from your startup disk. The quick scan will detect files with their original folder hierarchies and file names. The Deep Scan detects existing directory structures and searches the entire Mac hard drive for any files based on file patterns. 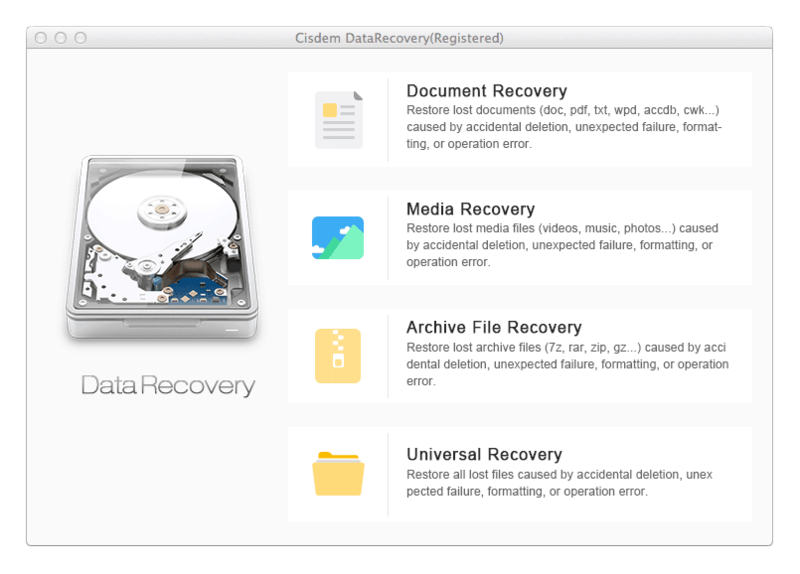 So, these are some of the best free data recovery software for Mac OS X. We hope that now you are able to retrieve lost data back using these Mac data recovery software free download. If you really find this guide top 10 best data recovery software for Mac to recover deleted, formatted or inaccessible files and folders, photos, music, videos, emails, and archive files etc. useful for you then feel free to share your valuable comments with us. Also, fell free to let us know which hard disk recovery software, file recovery software, or best free data recovery software for Mac OS X you are using from a very long time? According to you, which is the best Mac data recovery software to recover data on Mac OS X? There are so many other great mac data recovery software not include. Thanks for sharing this nice article about Recovery Software for Mac OS X. This is article is really nice & valuable specially for Recovery Software for Mac users. Those look for Data Recovery. I can’t believe TunesBro DiskGeeker for Mac didn’t make the list. It is my fav and i’ve used them all. they discount the program every weekend (maybe nights too).